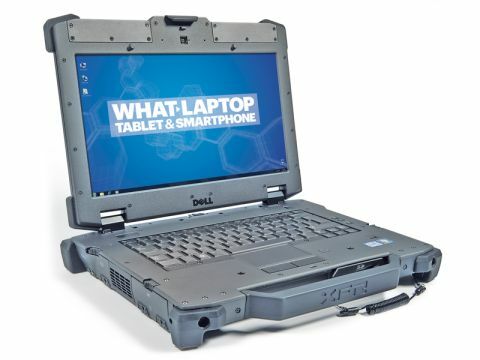 The market for rugged laptops is select and Dell has done an impressive job with the Latitude XFR 6420 by focusing on what's important. Build quality is excellent and extra features show real attention to detail. The XFR looks ready for anything. The tough, plastic composite chassis is together with plenty of screws and any point of the laptop likely to come into contact with the ground is shrouded in tough rubber. There's even a built-in handle that enables you to carry the entire 4.5kg machine like a briefcase. There was no flex around the chassis at all. The entire machine is harder than a coffin nail and all the ports are hidden by dust covers that mean mud, dirt, water, sand or any other muck won't get inside and play havoc with the connections. Dell hasn't put a Super-TFT coating over the 14.1-inch screen, meaning you'll be able to see what you're doing when using the XFR outside. There are no reflections and the display itself is very bright. However, colours look whitened and washed out, which is noticeable when you're watching videos or looking at pictures. Unfortunately, we can't say the same about the keyboard. Any laptop needs to have a decent keyboard and the compact, moulded keys on the Dell are miss-hit all too easily. There's no numeric keypad or backlight so using the keyboard for numbers and spreadsheets will be difficult and using it in the dark is nearly impossible. Because the machine is so sturdy, using the touchscreen is easy because the lid doesn't wobble on its hinges when you touch it. Windows 7 is still too fiddly and small to navigate through folders, but for simple tasks it works very well. Again, this is a case of Dell focusing on what's necessary and stripping back the rest. This is one of the most impressive rugged laptops we've seen and if you can get past the keyboard, it'll stick with you through thick and thin.